If your mower's engine is idling too high or running at too high a speed, your problem may be the throttle cable. 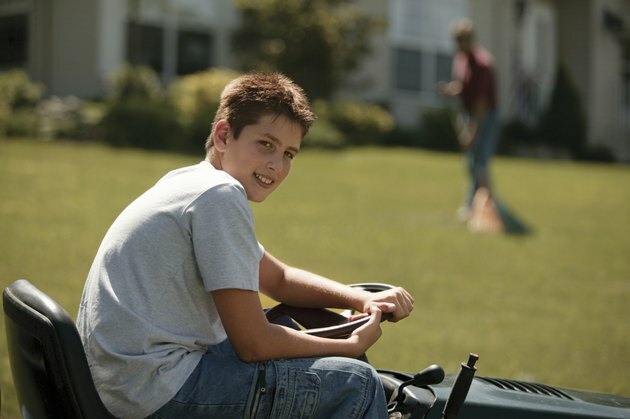 Before you head off to the repair shop with your mower, consider the following tips. Adjusting and replacing the throttle cable can be done at any level of mechanic skill. Remove the cable housings using a pair of pliers. The housings will swivel off the base and slide down the cable. Detach the cable from the throttle arm on the engine. Remove the cable by opening the unit and unscrewing the lock screw on the handle. Thread the cable wire through the housing. Locate the wire base on the back of the engine and run the cable through the throttle base and the throttle arm. Slide the cable through the housing and then into the handle unit to attach it to the throttle handle. Make sure you have the throttle all the way down so the cable is tight. Pull the cable with a pair of pliers to make it tight and turn the lock screw. Replace all housings. Test the tension by replacing the throttle. Start the mower. Loosen the cable if the mower is running too high when set in the idle position. Loosen, not remove, the lock screw and feed a bit more cable through the slot and re-tighten the screw.